This two-part audio-visual recording from the archives of the Door-Darshan, affords a rare encounter with a remarkable musician of the past generation: the late Pandit Maniram, eldest brother and guru of the illustrious, Pandit Jasraj. The first part of the presentation is an illuminating interview of Pandit Maniram. lie has been interviewed by the Late Pandit Vinay Chandra Maudgalya, an equally famous personage in the world of Kindustani music, a notable musician, musicologist and founder of the Delhi Gandharva Mahavidyalaya. 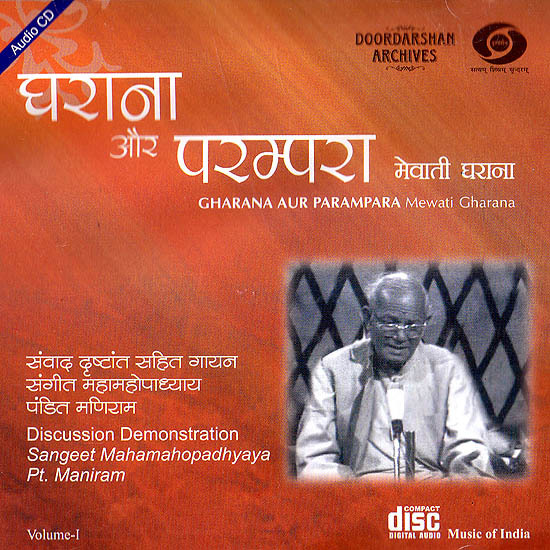 Pandit Maniram talks about his gharana, the Mewati ‘school’ of music. ft is interesting to note that Pandit Jasraj, who was a sparkling young musician at the time, is also present in the interview and takes a lively part in it. This unique presentation brings back to life Pandit Manirarn’s gentle personality, and in surprising contrast with it, his forceful, far-ranging, incisive yet supple singing voice. The second part of the presentation is a rendering of rags Bageshwari by Pandit Maniram. A collectible piece since little of Maniramji’s music survives in recordings. The interview, which concerns the Mewati gharana, is of great interest, as it is a younger gharana and is relatively lesser known. Pandit ji talks about the history and the salient features of the gharana. tie also presents the gharana musically, and in this he is accompanied by Pandit Jasraj (also, Pandit Jasraj’s disciple, Girish Wazhalwar). The centrality of alapa (free musical elaboration) in raga-music makes it a very individualistic art, which it has been for centuries. In the late 18th century with the flowering of khyal singing, emerged the typically Hindustani institution of the gharanas, which can be described as ‘schools’ of music cultivating a style of their own but with the difference that they also have a family connection, being generally nurtured and transmitted within a family (or ghar’, hence ‘gharana’), A Khyal gharana tended to be a microcosm complete in itself, though rooted within the larger world of Hindustani musical culture. It not only had a style and idiom of its own it also preserved created and transmitted a whole corpus of compositions in the traditional ragas including ragas of its own. Its commonness of style as is true of any noteworthy school in the field of thought or the arts was never at odds with individual imagination and innovation without which indeed it could never be sustained. It was from its beginning a dynamic institution older gharanas of which Mewati is one. New gharanas were initiated by inspired individuals making a new depature out of the old. The progenitor of the Mewati Gharana was Ustad Nazir Khan who was as Pandit Ji tells us trained in the well established Gwalior gharana. Nazir Khan then taught Natthulal who passed on the art of his nephews Motiram and Jyotiram Pandti maniram and Pandit Jasraj are the sons of Pandit Motiram. It could be worthwhile in this context to look at some documented historical information in order to supplement what Panditji says. The records of the court of Jodhpur show that Ustad Nazir Khan was active in Jodhpur as court Kalawant between 1871 and 1891. An essential part of his duty was to teach talented musicians. Natthulal was one of these. He proved also to be the one who then carried forward Nazir Khan’s musical legacy. So thanks to the open attitude of the court of Jodhpur Nazir Khan’s gharana flourished but continued in a ghar which was not his own. The musicians of the new ghar were original musicians on their own. Many Bandishes of Pandit Motiram and Pandit Jyotiram are still cherished in the gharana. The originality of Pandit Maniram and young Pandit Jasraj is evident in the audio presentation before us and allows us to be a witness to it. Both of them are revealed as creative vaggeyakaras. The style or gayaki of the gharana as described by Pandit Maniram lies on a line of tension between two opposing poles the still somber orderly dhrupad and the quick agitated gittering tappa. This also explains another stylistic feature mentioned by Panditji. The prevalence of the kan which is tappa like in spirit along with the robustly gliding meend and in the same vein the more ambitious ghasit (a smooth, thoughtful, sliding over notes) which are quite disparate in character. The stylistic tension provides space with the gharana for much individuality. We can be a witness to this in the presentation before us as we listen to the two brother Pandit Maniram and Pandit Jasraj render some compositions of the gharana together. They tend towards the two different poles of the style yet they blend together each forming a single individually sustained whole. A noteworthy trait of the gharana as both Pandit Maniram and Pandit Jasraj stress is the attention it pays to sahitya meaning the quality of the sung text as well as the purity of its musical delivery.